Ampersand is pleased to present What, Me Worry?, an exhibition of works on paper by New York artist Jeff Ladouceur. 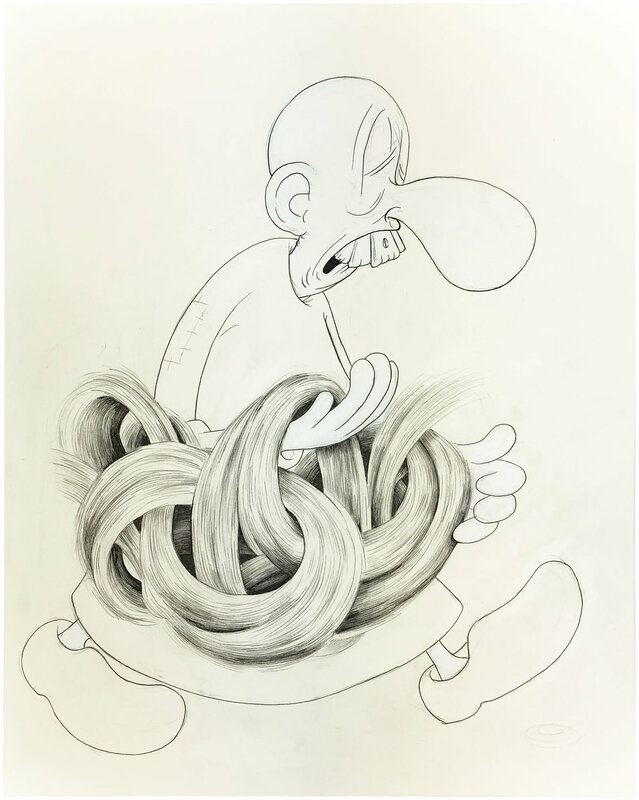 Dipping into an iconography that is distinct to his work, these new drawings illuminate a blooming, sagging, tangled world of characters and forms. “They are cartoonified archtypes,” he notes, “Meditations and mandalas. Pictures of people made of things or things made of people. Images of birth, blooms and bums. They rise and wilt, go away, then return.” Each drawing is a static moment of shifting and continuous motion or toil. While some characters might sleep or sag, others are occupied by ponderous pursuits—protesting with an empty geometric sign, setting fire to a wooden foot, transporting a dilapidated building on one’s back or simply walking and running. The latter could be read as an icon of escape, a metaphor for freedom, and yet his characters never seem to get anywhere in the same way that his dwellings never seem complete. “These figures may be their own home,” he says, “They may be homeless (or looking for a home, the eternal journey). They do seem to exist between worlds, a league of in-betweeners.” The drawings are woven with wisps of fog and tension but are held aloft by what Ladouceur considers an un-extinguishable sense of ridiculous joy and wonder. While one woeful fellow with wooden teeth plods along, for instance, another figure comprised of green flames strides by with wide eyes and euphoric smile. These pervading dichotomies mirror most the realities of daily life, the incessant comings and goings, the lifting and dropping, the haves and have-nots. It’s as though each drawing, like each day, is a loaded question. Canadian artist Jeff Ladouceur (b. 1976) is originally from Vancouver Island, British Columbia. He currently lives and works in New York. Known primarily for his ink and graphite drawings, he has also worked in sculpture, large-scale inflatables and mixed media. His work has been exhibited widely, including solo exhibitions at Richard Heller Gallery in Santa Monica, CA and ZieherSmith in New York. His drawings and sculptures will be the focus of a solo exhibition at the Burnaby Art Gallery in Vancouver, BC during summer, 2018. 15 1/8 x 11 in. 13 1/2 x 11 in. 14 1/4 x 11 in. 11 x 15 1/8 in.